Approved to BSEN3 with clear instructions for use, this range of extinguishers feature controllable discharge with squeeze grip control. Water - for carbonaceous materials such as wood, paper and textiles. Includes protection against frost. Foam - a queous film forming foam provides 'burnback' resistance giving protection against re-ignition. Suitable for flammable liquids such as petrol, oil, solvents and paints. 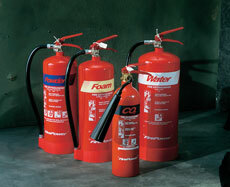 ABC Powder - gives rapid knock down of fires in a wide range of environments and safe on risks involving live electrics. CO2 - creates minimal secondary damage. Suitable for flammable liquids and fires involving live electrics. Foam - 6 litre filled weight: 9.8kg 45 litre (wheeled) filled weight: 91kg.